Sorry for being absent from posting here for a while. Been busy with work at the Penang Institute. The Institute recently organised a birthday bash for National Laureate Professor Muhammad Haji Salleh who is based in Penang. He went to the same high school as I and we are all really proud of what he did. During the birthday bash, the Chief Minister announced that Penang will be hosting a literary award entitled, Anugerah Sastera Pulau Pinang to encourage publications in Bahasa Melayu (Malay language) in Penang. I have been working on this for a while now especially through the Institute’s Forum Nusantara programme which I created last year. The Forum series, organised by Penang Institute and hosted in MPSP (where I am councillor) has become a regular feature in the intellectual and literary scene in Penang. With the support and leadership from our new CEO, my able colleague Zairil Khir Johari, we are finally able to establish this award as a practical way the State Government can show appreciation to the Malay language. 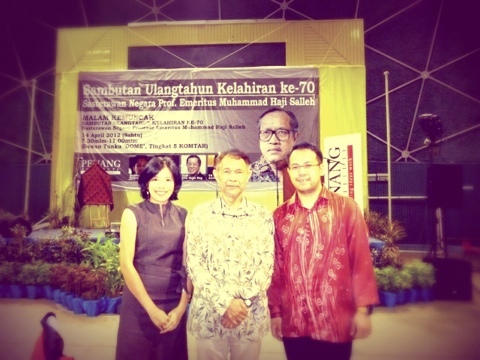 The birthday bash was attended by among others, Pak Goenawan Mohammad, renowned Indonesian public intellectual. I was impressed by the humility of this 70-year old grand old man whose intellectual contribution threatened no less than the Suharto regime in Indonesia. He delivered a very interesting lecture at the birthday bash of Professor Muhammad who is his good friend. His lecture was entitled, Belajar Dari Pantun (Learning from the Poems) dealt with lessons drawn from a critic of the literary form found in the Malay traditional poems. Even my wife was kept focused on Pak Goenawan as he spoke about how the poet held in tension, chaos and order within the poignant yet simple and entertaining pantun verses. His hegelian view of history was evident; and I noticed hints of Wittgenstein’s thought in his exposition on language as he contrasted the arabian linguist al-Jurjani’s (platonic) logocentricism with the living language of pantun in which the poet can only be understood because of the shared experience of humanity expressed in language. I was fascinated by how Mas Goen, Goenawan’s nom de plume, seemingly simple lecture on poems can speak to a myriad of people from politicians to philosophers to every sojourners of life. His generous compliment (“Terima kasih atas keakbraban di Penang.Khasnya dari anda,seorang anggota parliamen yg tulis ttg Wittgenstein” – Thank you for the friendship in Penang, especially from you a representative who writes about Wittgenstein ) rings in my inner mind to this day as a source of encouragement. Indeed, the friendship of Professor Muhammad and Mas Goen represented solidarity of those who struggled for the truth in any fields. Theirs was a relationship forged because both believed in a sacred mission and had weathered many storms of life due to their belief. To Professor Muhammad, happy 70th birthday, you are a pride of Penang and Malaysia, and to Mas Goen, my deepest gratitude for your valuable lessons and encouragement.